Don’t forget the lecture by Pam Laing this Sunday at the Creekside Theatre in Lake Country (Winfield). From Eagles to Hummingbirds. 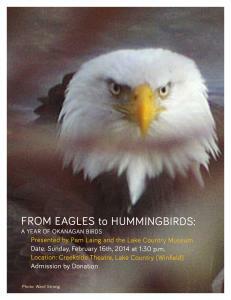 A Year of Okanagan Birds will be presented by the Lake Country Heritage and Cultural Society. The canal between Kalamalka and Wood lakes was opened in 1908. The name of the first post office in Winfield was Alvaston. The Maddock Brothers developed the town site of Okanagan Centre. Edith and Jim Gleed ran “The Store” in Okanagan Centre until after WWII. The CNR operated its first train between Vernon and Kelowna in 1925. James (Jim) Goldie was the long-time manager of the Rainbow Ranche. The Eijiro Koyama family was the first Japanese-Canadian family to settle in Winfield. The Petrie family ran a resort at the southwest corner of Wood Lake (Petrie’s Corner). The long hill ascending from Woodsdale to Oyama on the east side of Wood Lake is known by the locals as M.P. Williams’ hill. M. (Malcolm) P. (Parker) Williams purchased the old Thomas Wood property at the south end of Long (Kalamalka) Lake and built his house on the hill. The 1870s. The Commonage was established in 1876 after the commissioners of a Joint Indian Reserve Commission passed Minutes of Decision to establish eight Indian reserves and a Commonage reserve in the North Okanagan. The Commonage was reserved for grazing by the cattle of both the Native people and the new settlers.